It has been a tremendous off-season for members of the Barrie Lacrosse community, with an amazing six players & one volunteer receiving awards from the Ontario Lacrosse Association. Wyatt King, Jim Lowe, Josh MacIssac, Jakob Power, Devin Shoreman, Ty Steele, & Ethan Woods have been recognized by the OLA for their accomplishments in 2018. Devin Shoreman & Jim Lowe (Barrie Minor Lacrosse) - Shoreman, a member of our 2018 U17 Field & Midget Box teams, became the first Barrie player to receive the prestigious Tucker Williams "Courage" Award, presented to the OMFLL member who has displayed great strength and fortitude in overcoming personal tribulations to participate in lacrosse. Shoreman received the award after an emotional speech on behalf of the Williams family by lacrosse legend Steve Toll. Toll talked about how Shoreman was diagnosed with Genetic Episodic Ataxia when he was 12, after dealing with its effects for six previous years. Despite the fact that the issue will randomly stop Shoreman's large muscles from working during competition, he developed into an exceptional athlete. The psychological effects of this type of issue can be devastating as it is somewhat random and needs to be constantly monitored and managed. Shoreman's incredible journey made him an ideal choice for this inspiring award. Lowe, known to many as "The Voice of Barrie Lacrosse", received the Merv MacKenzie award as the person who had done the most to promote the sport in their city, zone, and province-wide. In addition to his well-known presence as a lacrosse announcer and television broadcaster, Lowe has worked hard to promote field, box, and girls box lacrosse at all levels. It is the first time that a member of the Barrie Lacrosse community has received this award. Jakob Power & Ethan Woods (Barrie Lakeshores) - 2017 BMLA graduate Power, now a member of the Barrie Lakeshores, had a stand-out season with the Barrie Jr. A club. 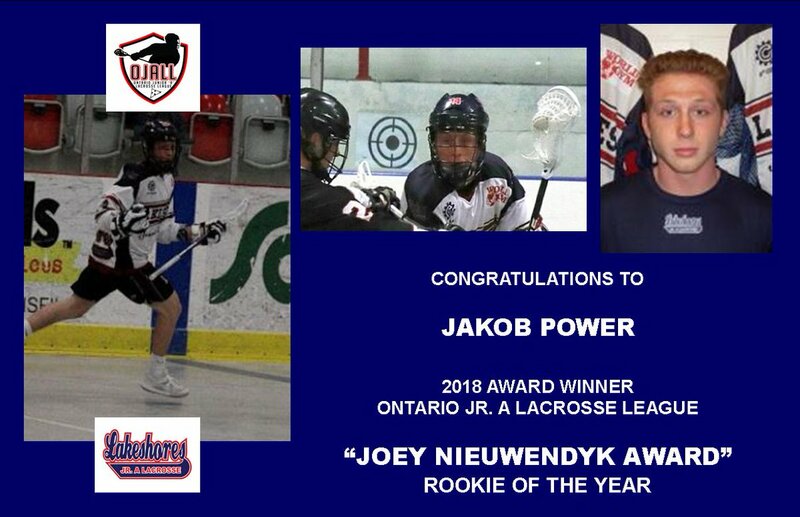 Power is the first BMLA alumnus to win the prestigious Joey Nieuwendyk Trophy, awarded annually to the most outstanding rookie in Jr A lacrosse. Power's teammate, Woods (a graduate of Owen Sound Minor Lacrosse), was named to the OLA Jr A Second All-Star team for his work in the Lakeshores' net. 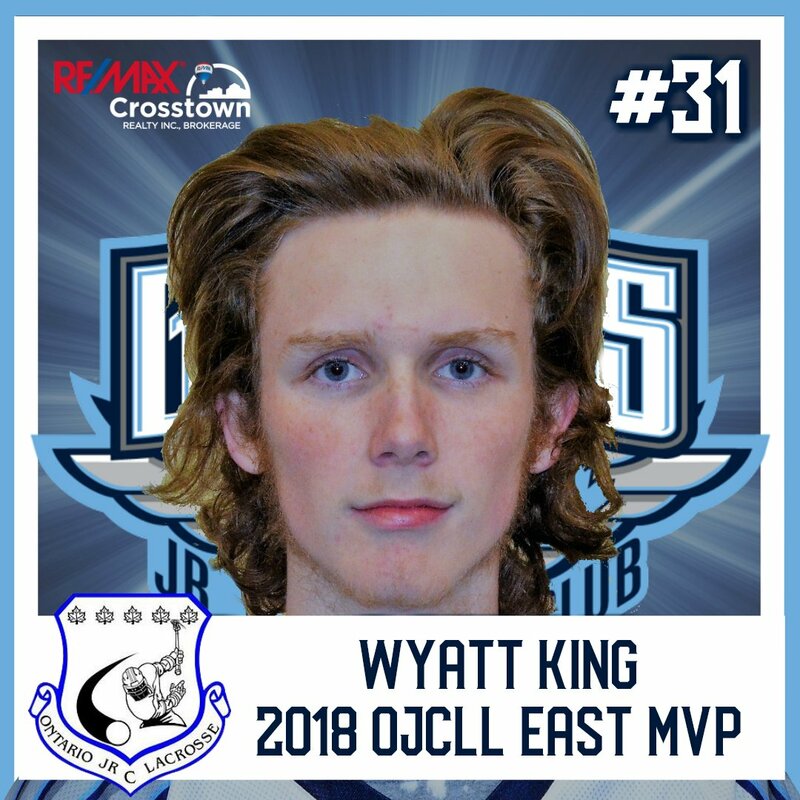 Wyatt King, Ty Steele & Josh MacIssac (Barrie Jr C Bombers) - 2016 BMLA graduate King, now a member of the Jr. C Barrie Bombers, was named the Most Valuable Player in the Ontario Junior C Lacrosse League's Eastern Division. King's exceptional play in net helped lead the Bombers to a franchise-best third-place finish this season and a thrilling playoff series against the eventual Meredith Cup Champions, the Peterborough Lakers. Teammate Steele, who played as a midget for BMLA, became the second Bomber in two years to be named the league's Most Sportsmanlike Player. MacIssac, acquired by the Bombers at the trade deadline, was co-winner of the Top Defensive Player award in the OJCLL West. Congratulations to all seven of you. You have made Barrie Lacrosse proud! Barrie Minor Lacrosse provides field and box lacrosse programs for children aged 3 to 17. For more information, please visit www.BarrieMinorLacrosse.com or email info@barrieminorlacrosse.com. For information about the local Junior Lacrosse teams, please visit www.lakeshoreslacrosse.com and www.bombersjrclacrosse.com.